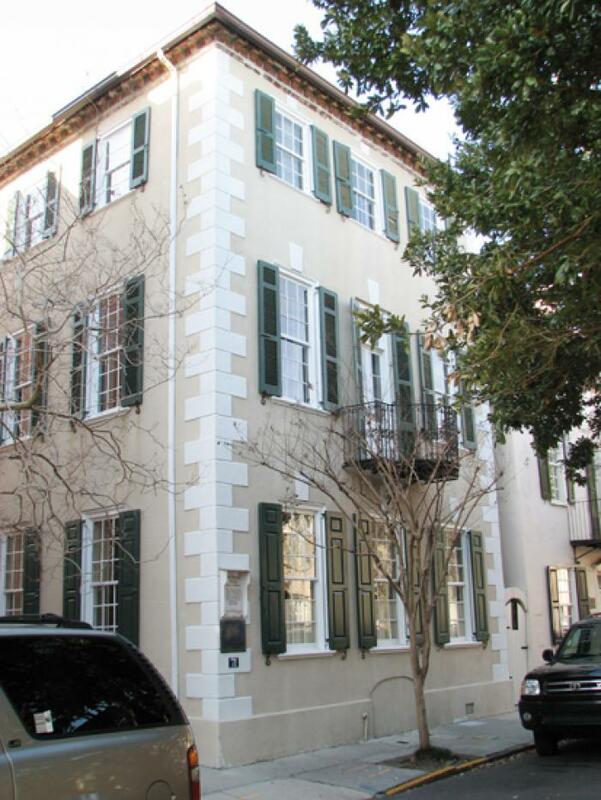 The Robert Brewton House is the earliest accurately dated example of an architectural type known in Charleston as the “single house,” built in 1730. Standing three-stories high, the house has its narrow side to the street, its entrance at the side, is just one room wide across the street front and just one room to either side of the hall on all three floors, has no basement below ground, and extends into a long narrow garden at the rear, containing kitchen, carriage house, and servants quarters. At the exterior of the house we should notice the low basement, with crawl space entrance at the street front, the French doors from the drawing room at the second story, the scaling of the façade through smaller third story windows, and the spars detailing of stucco, pretty much limited to a keystone-like element over each window and the quoining of the corners. The iron-grilled balcony of the drawing room is a later addition, as well as the three-story porch tucked into the corner formed by the rear end of the side and the kitchen. A carved flat door lintel and a cornice with small consoles are the two chief carved ornaments at the exterior. The interior contains interesting and skilled carved mantelpieces, some from a later period, and Georgian chair rails, wainscoting, and cornices. While the Robert Brewton House then, which is without a piazza, may at first appear to be lacking an important single-house element, its early date argues that it represents a “pre-piazza” phase of building. The house did acquire side wooden porches, first one story, and then two, but they are no longer in place. Listed in the National Register October 15, 1966; Designated a National Historic Landmark October 9, 1960.